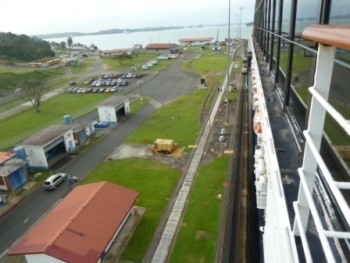 The sun was just rising at 6:30 AM when we entered Gatun Locks in the Panama Canal. 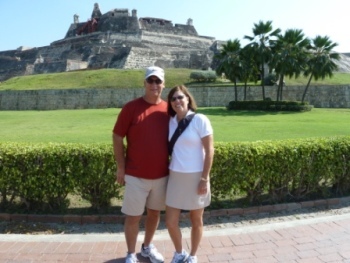 Behind us was a narrow passage that led back to the Caribbean Sea and the Atlantic Ocean. 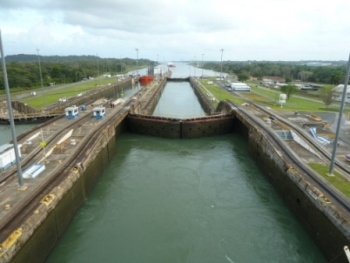 The Gatun Locks were actually a series of basins that served as an elevator for our ship. 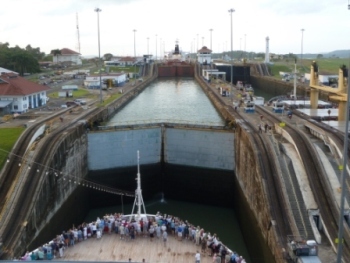 Our ship was so large that it nearly filled the lock. 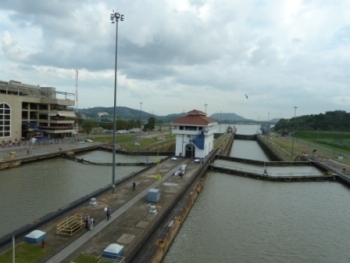 Ahead we could see Gatun Lake, the highest point of the canal. a nine hour journey of 47 1/2 miles. 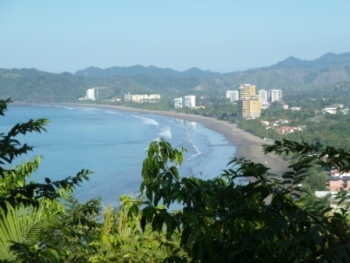 Jacó, Costa Rica. 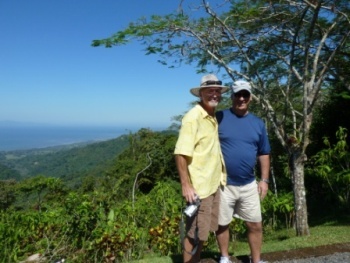 We drove up a one lane, eroded dirt road to enjoy a sweeping view of Jacó, the coast, tropical foliage and waterfalls. 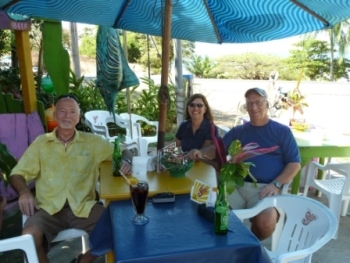 For lunch we had a heaping platter of BBQed ribs, onion rings and steamed vegetables at a beachside café. 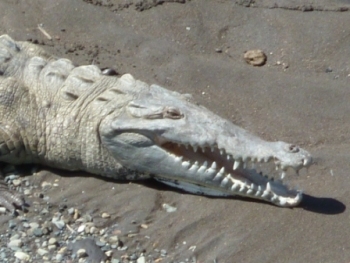 Being a local, Don knew where to spot a huge group of crocodiles in the Tárcoles River. 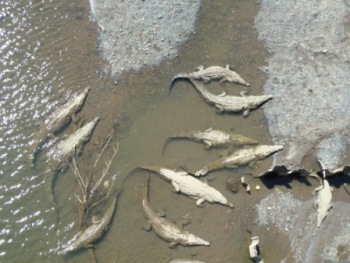 We stood on the bridge and watched them swarming below us attracted by the silvery fish in the water. 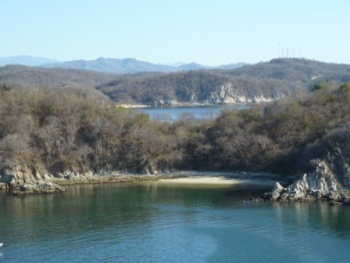 In Huatulco, Mexico we spent the day snorkeling along the beaches and rocky shores. 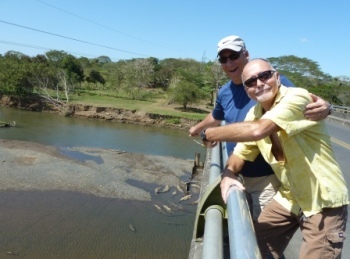 We saw the largest pufferfish we had ever seen - the size of a football - plus an eel. 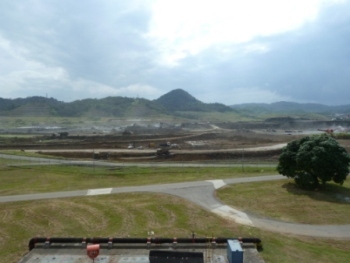 When it didn't seem afraid of us, we decided we'd better leave that area! 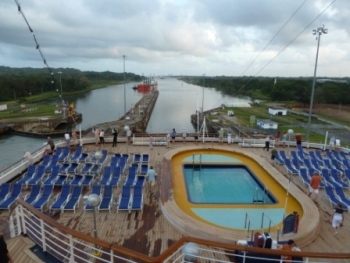 As we sailed out of Huatulco's Harbor the water erupted inside circular pools. 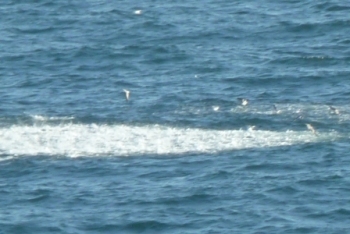 We found out that dolphins had rounded up large schools of fish that began leaping into the air to get away from them. Pelicans and seagulls swooped in to catch the fish from the air. 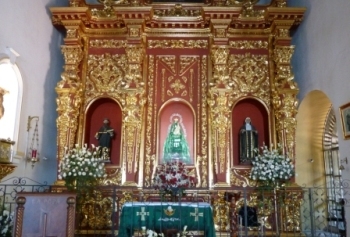 Puerto Vallarta, Mexico was as beautiful as ever. 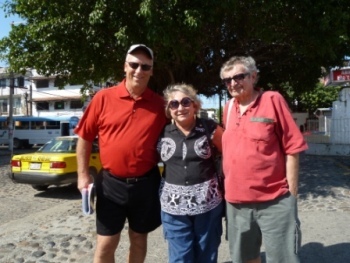 Our friends, Jimmie & Mary, met us at the port and we spent a great day with them. 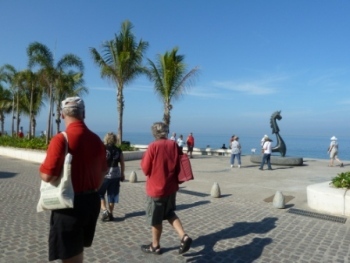 Jimmie was our knowledgeable guide on the new Malecón area as we strolled in near perfect weather. 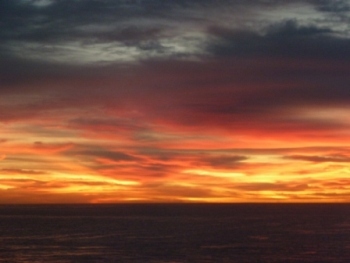 The morning sky above the dark water in Cabo San Lucas, Mexico was so intense it was almost scary. 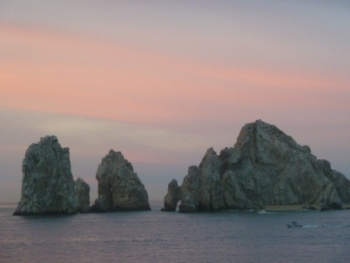 Fishermen were out early near the famous "Los Arcos". 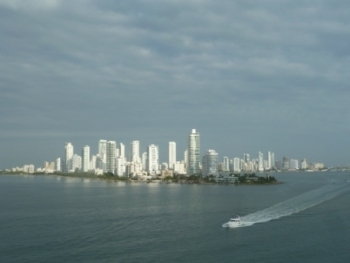 We didn't expect to see such a modern skyline as we approached the city of Cartagena, Colombia. 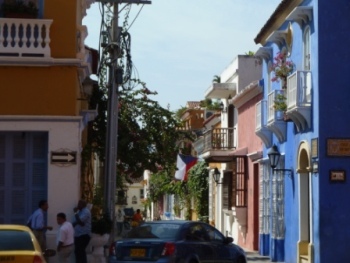 The modern hotels and skyscrapers hid the lower colorful buildings in the charming, colonial old town. Above the city at the La Popa monastery, they were celebrating a week-long festival in honor of the Virgin. 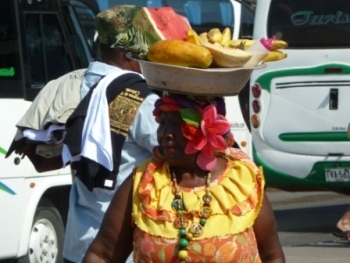 Inside the walls of the Old city center, ladies skillfully balanced pans of fruit on their heads. 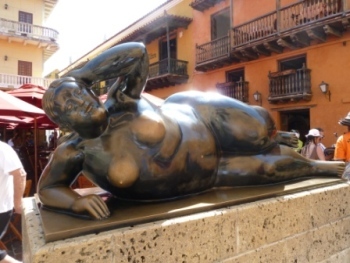 The Fort of San Felipe de Barajas Cartagena is home to Fernando Botero, artist and creator of this rotund reclining woman. Hey, wait, we've seen her on the cruise ship!